Today’s fun fact is courtesy of May being Skin Cancer Awareness Month. Other than humans, pigs are the only animals that can get sunburned. OK, astute readers will point out the fallacy of that as their folliclly challenged dogs or cats can get burned but this makes for a funnier “fact”. I know many of you like your bacon fried but don’t fry your own bacon. Use sunscreen. Find at more ways to prevent skin cancer this month at Cancer.org. Bearman Charity Challenge NEW MATCHING Donations. You all know by my announcement last week that I will match donations up to $500 to Crayons 2 Computers by simply making your donation in honor of Bearman Cartoons on the donation page. Well someone has stepped up to match donations made this month to the Brandon C. Gromada Head and Neck Cancer Foundation. So if you donate this month to the Foundation, send an email to bcd.headneckcafdn@gmail.com saying it is in honor of the Bearman Cartoons Charity Challenge and your donation will be matched!! COOL!! I am always humbled by the response to the charity challenge so thanks to all of you for your efforts in spreading the word about these great organizations. Week 1 Grand Total of $600!! I guess we should be buying sunscreen for all those poor pigs now. Do Wombies go out in the sun? I prefer my basement laboratory. I live in Germany so my risk is lower than when I lived in Missouri. Though I’m keeping my eyes peeled to funky spots and moles because I have had plenty of sun burns. Near the Alps? Wouldn’t higher altitude make you more susceptible? A good message to highlight Bearman. That’s one very e=relaxed pig. I always make sure to wear a hat on sunny days. I forgot this important rulke about a month ago & moy little bald head was very red & sore. I actually knew pigs could get sunburn! Not sure where I learned this. I thought elephants could also get sunburned? Hot dog!… or pig. Or pork hot dog. Or whatever. I went to a cookout the other day and I ate a hot dog and it didn’t even occur to me to ask if it was beef or pork. I think it was pork. That’s what I get for making a pig of myself. It’s why they love mud so much! Great public service announcement. “Eat more Bacon” was the message right? 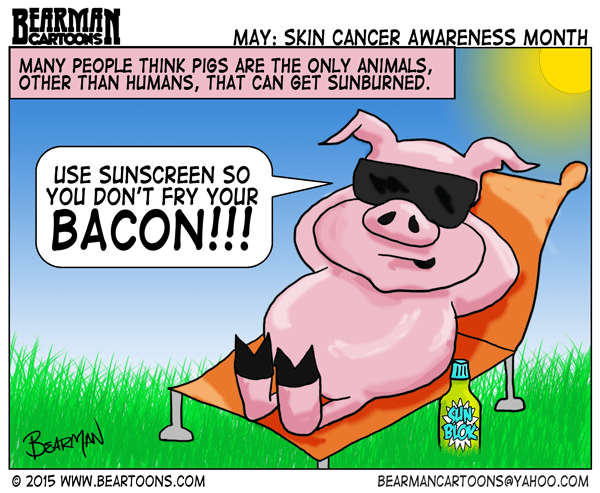 Skin cancer is nothing to oink at!